Cocodent features the world's first coconut oil natural dental care products made without the harmful chemicals found in most other brands. Coconut oil is a proven antimicrobial that kills the bacteria that causes tooth decay and gum disease. When mixed with other botanicals, coconut oil also helps tooth sensitivity and remineralization. Even "so-called" natural tooth products contain ingredients that shouldn't be used in the mouth and they are not as effective as pure coconut oil. Coconut oil has been proven to be more effective at fighting tooth decay than Fluoride without the harmful side effects. 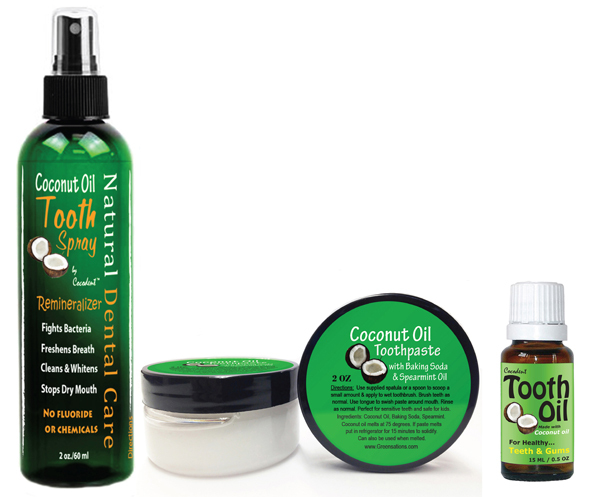 The Cocodent dental care line features a natural toothpaste, tooth spray and tooth oil. Coconut Oil Toothpaste cleans and whitens teeth while fighting decay and promoting healthy gums. Cocodent Tooth Spray uses antibacterial Coconut Oil & Cacao to fight decay, freshen breath and strengthen teeth. Cocodent Tooth Oil promotes healthy gums and teeth to fight gingivitis and tooth decay.